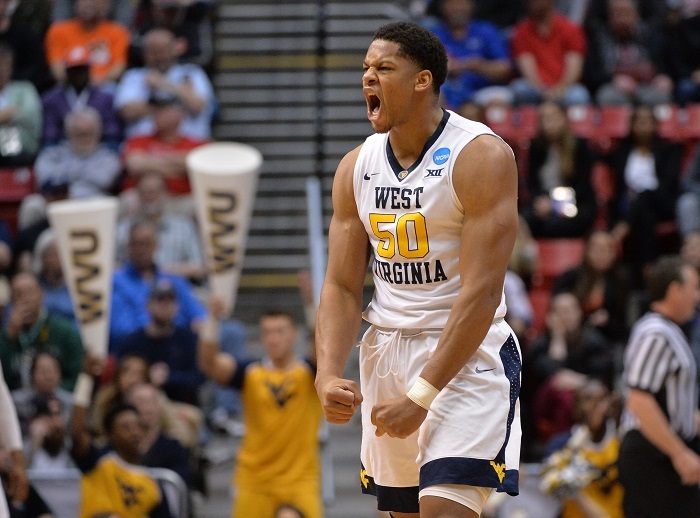 How they got here: West Virginia was an at-large selection for the NCAA Tournament. Villanova won the Big East Tournament, securing an automatic bid. Tournament results: West Virginia — def. Murray State, 85-68 (round of 64); def. Marshall, 94-71 (round of 32). Villanova — def. Radford, 87-61 (round of 64); def. Alabama, 81-58 (round of 32). West Virginia — F Esa Ahmad (10.2 ppg, 5.5 rpg), F Wesley Harris (5.5 ppg, 3.6 rpg), F Sagaba Konate (10.8 ppg, 7.6 rpg, 3.2 bpg), G Daxter Miles Jr. (12.8 ppg, 2.8 rpg, 3.1 apg, 1.3 spg), G Jevon Carter (17.4 ppg, 4.7 rpg, 6.6 apg, 3.0 spg). 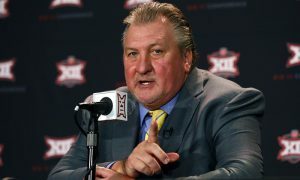 Head coach — Bob Huggins (845-340 overall, 255-129 at West Virginia). Villanova — F Eric Paschall (10.2 ppg, 5.1 rpg, 2.3 apg); F Omari Spellman (10.6 ppg, 7.9 rpg); G Phil Booth (10.6 ppg, 3.1 rpg, 2.9 apg); G Mikal Bridges (18.0 ppg, 5.4 rpg, 2.0 apg, 1.6 spg); G Jalen Brunson (19.1 ppg, 2.1 rpg, 4.7 apg, 0.9 spg). Head coach — Jay Wright (537-249 overall, 418-165 at Villanova). 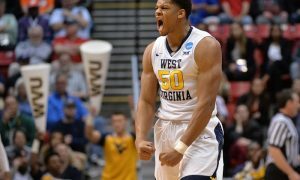 About West Virginia: The Mountaineers reached the Sweet 16 for the eighth time in their last 12 NCAA Tournament appearances with their win over Marshall. Carter has been on a mission since the NCAA Tournament began, and it shows up in the stat sheet. After scoring 21 points and dishing out 8 assists against Murray State, Carter produced 28 points, 5 assists and 5 steals against Marshall. Carter may be playing at the highest level of the season, and it comes at the perfect time. That makes the Mountaineers better all the way around. The defense is back at a high level, too, producing 18 turnovers vs. Marshall and 16 turnovers vs. Murray State. The Mountaineers are also getting balanced contributions from other players, making them harder to defend. Against Murray State Teddy Allen gave WVU 16 points off the bench, while Ahmad and Konate hit double figures. Against Marshall Lamont West produced 18 points and James Bolden 11 off the bench, while Ahmad pitched in 10. The Mountaineers have eight players that are producing in some way on both sides of the floor. About Villanova: The Wildcats won the 2016 NCAA title and two years later they look primed to do it again. The hard part for any opponent is the fact that six different players average double figures in scoring. So, you can focus on Brunson all you want (Villanova’s leading scorer with 19.1 points per game), but he’ll just dish it to Bridges, Booth, Spellman, Paschall or Donte DiVincenzo, who are just as capable of scoring. In fact, it was DiVincenzo’s shooting in the first half that shot the Wildcats ahead of Alabama in the second round. Due to that, the Wildcats are the No. 1 scoring team in the nation and No. 15 in assists. Where the Wildcats struggle a bit is in rebounding and points allowed. The Wildcats are No. 172 in rebounds per game and No. 118 in points allowed per game. Wright is a master tactician and he’s riding a wave of 3-pointers. The Wildcats have made 31 3-pointers, the most in back-to-back NCAA games since Loyola Marymount in 1990. Prediction: The matchup to watch in this game is Carter vs. Brunson, and it should make for great television. Carter, for my money, is the best defensive guard in the game. Brunson, meanwhile, is one of the game’s top offensive players. Watching them go after it one-on-one should be entertaining. Let’s assume that Carter and Brunson cancel each other out, because Carter has been Brunson’s equal on offense of late. Then it comes down to the rest of their respective teams. The Wildcats’ offense is scary productive, but the Wildcats have lost four games this year. To do that, you had better be prepared to either hold the Wildcats well below their season average in scoring or play offense at their level (Butler had to score 101 points to beat Villanova in late December). For West Virginia, it’s all about the defense, because I don’t think they can play offense at Villanova’s level for 40 minutes. If the Mountaineers can keep the Wildcats below 75 points, they have a shot. If they can’t then the Mountaineers probably don’t. There’s a reason why Villanova is a No. 1 seed, and the way the Wildcats are playing right now I don’t see the Mountaineers taking this one. 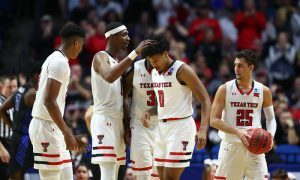 Next up: The winner moves on to the Elite Eight to face either Purdue or Texas Tech.